The Histadrut labor union on Thursday declared a work dispute in all of Israel's hospitals. A strike could evolve within weeks. Just weeks after a major strike at Hadassah Hospital in Jerusalem ended, the Histadrut labor union on Thursday declared a work dispute in all of Israel's hospitals. The declaration comes a day after the Knesset held hearings on the state of health care in Israel, with union officials accusing the Treasury of “hollowing out health care” by cutting budgets and failing to pay doctors and nurses living wages. According to Israeli law, a work dispute is required in order to declare a full strike among unionized workers. After declaring a dispute, the union and institution – in this case, the Treasury, negotiating on behalf of Israel's public hospitals – are required to engage in binding arbitration to resolve the conflict. If no resolution is found, the union can declare a full-blown strike two weeks after the work dispute declaration. 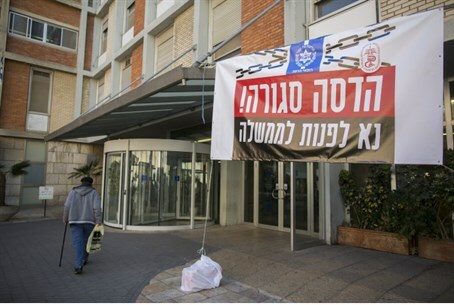 According to Avi Nissenkorn, head of the Histadrut's professionals union arm representing doctors and nurses, “the Finance Ministry's handling of the strike at Hadassah Hospital has brought the entire health system to a crisis point." The interim agreement reached in February between workers at Hadassah and the Treasury was for just two and a half months, during which time the two sides were supposed to negotiate a permanent deal. Such a deal has yet to be reached, and the union is demanding a total solution to the budget crisis not only at near-broke Hadassah, but at all Israeli public hospitals, many of which are in debt. If those issues are not resolved, said Nissenkorn, workers would have no choice but to strike.